Obtaining a Community Forest (CF) tenure on the Crown Forest lands and managing it sustainably, while allowing for a modest harvest to occur for the development of a local forest products related economic sector, has consistently, since the 1990’s, been a top priority for the great majority within the Cortes community. 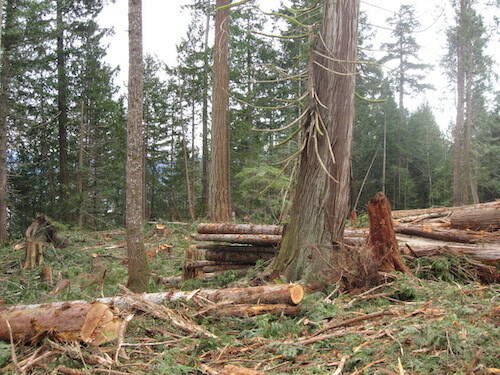 How can we determine a rate of timber harvesting that will result in a reasonable assurance that our Community Forest ecosystems will be sustainable over time? On the surface it appears very challenging, considering the complexities inherent in a healthy forest ecosystem and the variable impacts of the many different possible approaches to harvesting and management. However, if we step back from those complexities and look at the underlying dynamics of any healthy ecosystem, we find that, large or small, complex or simple, it must be able to acquire or generate the nutrients required to maintain its complex metabolic functions and health plus a “surplus” to cushion the system through lean times. Mature forest ecosystems generate more than enough nutrients to thrive, with excess being stored structurally or in the forest soils. The Pacific Coast Temperate rain forests were sustainable following, the last glaciation, with the harvesting levels that supplied the needs of Indigenous people. However, as demands for timber grew, exports rose, technology advanced and harvesting rotation periods diminished, extraction rates have risen to the point where these ecosystems are increasingly being degraded and are patently no longer sustainable. Post harvest, most of the nutrients needed by the slowly regenerating young forest are derived from accumulations stored in the landscape from previous generations. Over time, a wide diversity of organisms re-establish themselves in complex, interconnected and interdependent relationships that are increasingly able to generate the nutrients necessary for sustaining a complex forest ecosystem. Forest soils accumulate very slowly, suggesting that the “surplus” nutrients are a small proportion of the total that is produced, with the larger proportion supporting the ongoing requirements of all the organisms living within the ecosystem. the later stages when nutrients are being accumulated, the forest system and landscape will be repeatedly degraded by each short rotation harvest. Unfortunately this is what is happening in British Columbia. There is growing recognition that the impact of conventional forest management, exacerbated by the shortening of the “rotation age” (often now down to 30 – 60 years between harvests), is removing far too many of the nutrients from these forest landscapes for them to be sustainable. The fundamental question remains – how much of the accumulating nutrients in the ecosystem can be extracted in any form, timber or biomass, without slowly or rapidly reducing its ability to remain healthy and sustain itself over time? Answer: Look To Nature & Its Sustainable Ecosystems. It is difficult to find any examples of human managed forests that have proven to be sustainable over millennia. 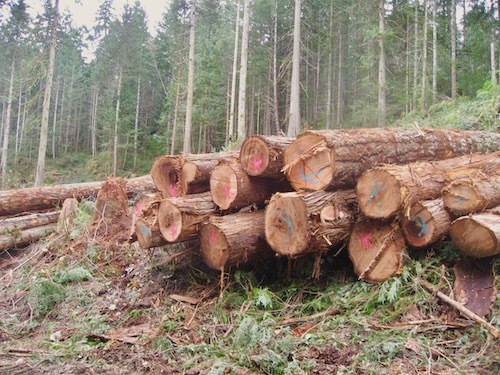 However, in the natural world, there are many “consumptive” dynamics that have been functioning sustainably within ecosystems for thousands or millions of years that can provide a useful indicator as to what proportion of the accumulating nutrients might be sustainably removed under the management guidelines set for our Community Forest. Looking at the examples found (see below) of those sustainable relationships that have been quantitatively studied, a consumption rate of between 15 and 22% of the Annual Incremental Growth of the consumed has been demonstrated. Harvesting timber from a forest is also a consumptive activity but, even more, is an extractive one, as it mostly removes from the forest ecosystem the nutrients required to grow the timber harvested. In nature, almost all of the consumed nutrients remain in and are recycled within the ecosystem. Giving consideration to the indicators from the studies of sustainable “consumptive“ relationships mentioned below and given that timber harvesting is not a closed loop paradigm where nutrients remain within the ecosystem, the average harvest taken, over any five years, from the Cortes Community Forest should be limited to 15% of the Mean Annual Incremental growth (MAI) of the forest within the tenure land base. The MAI initially assumed by the Ministry of Forests to occur within the Cortes Community Forest needs refinement over time through establishing and regularly monitoring permanent sample plots throughout the landscape.These findings will reflect the actual forest growth occurring in our Community Forest ecosystems and the recommended harvest volumes will automatically adjust to reflect conditions . The Community Forest will, barring unforeseen catastrophic changes, be sustainable in perpetuity, satisfying the community’s top priority. Eighty-five percent of the annual accumulation of nutrients will remain in the ecosystem to maintain its health. The harvest volume will be responsive to positive or negative changes of the MAI within the CF found through regular updating of data from permanent sample plots. This provides a simple, understandable and measurable foundation for the creation and implementation of an Ecosystem Based Management plan for our CF. The regular annual harvest of timber from the Community Forest will provide a stable foundation for further development of local forest sector economic activity. Size, quality and value of timber harvested and made available to local entrepreneurs for processing and value-adding will increase over time. 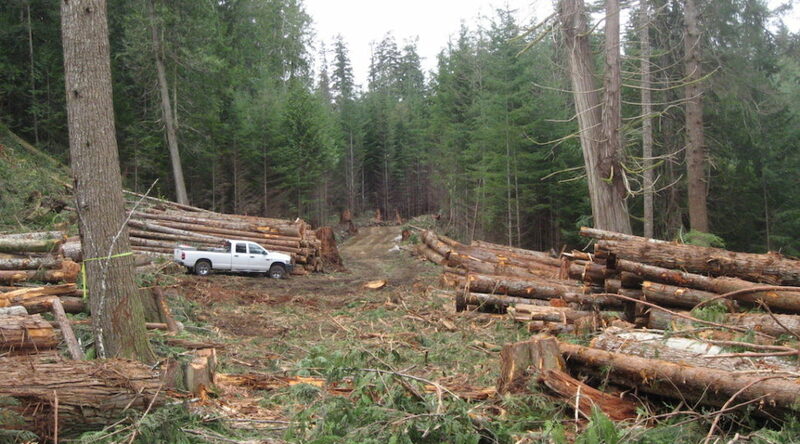 Local economic benefits will grow significantly as competing large, high quality timber from other sources diminishes. The forests will age relatively quickly as the “rotation age” for the timber harvested will be in the 250 – 300 year range. The Community Forest will gain many “old growth” characteristics as the portion of the forest that is outside the Timber Harvesting Land Base (THLB) ages and areas within the THLB will incorporate “full cycle” and rotation age trees. Epiphytes and mycorrhizal fungi, potential major sources of nutrients for an older ecosystem, will have adequate time to re-establish healthy populations. The forest will become more biodiverse and robust as it ages, improving resilience and its ability to respond to the impacts of global warming and climate change. Salmon runs will increasingly benefit from the re-establishment of more natural hydrological cycles through the landscape and streams of Cortes. The tourism sector of the Cortes economy should benefit from the increasing attraction of an ageing and sustainably managed forest. It will initiate and demonstrate a dramatically different and “justified-by-Nature” approach to forest management; for our community, visitors to Cortes Island and for people from outside Cortes wishing to see a forest managed sustainably. Verbal report about a 1989 CBC “Nature of Things” program on 17 year studies of the Peregrine Falcon/Ancient Murrelet relationship in Haida Gwaii. The scientist found a predation rate by the falcons of ~ 15 – 20% of the annual growth of the Ancient Murrelet population, which reflected a sustainable relationship over time. Prof. Ian Stirling, Univ. of Alberta, polar bear specialist, has found predation rates by polar bears of ring seals (95% of the bears food) to range between 15 and 22% of the annual incremental growth of the seal population. An article in the New York Times on Aug 3, 1999 by Nicholas Wade stated that: “Biologists believe some 15 percent of the leaf production of tropical forest disappears down the nests of leaf-cutter ants”. Leaf cutter ants have existed for over 50 million years, providing an excellent example of a sustainable consumptive relationship. Prof. Tom Reimchen, U.Vic., quotes in his article entitled “Some Considerations in Salmon Management”, studies by A.R.E. Sinclair of the population dynamics in the Serengeti that conclude “In the Serengeti, the social and solitary cats take about 16% of the total prey biomass”. Opinion of Herb Hammond, RPF (Silva Forest Foundation) and referencing Prof. Jerry Franklin, (University of Washington), March, 2014.